Dorico Showcase: Mark Nowakowski’s …with their names upon their arms. 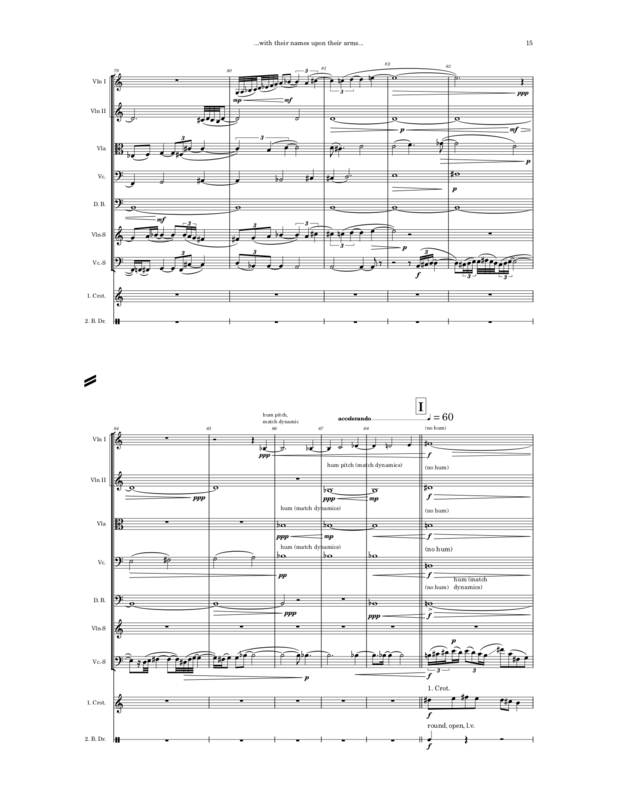 In November of last year, a new work for solo violin, cello, percussion, and orchestral strings by composer Mark Nowakowski was given its world premiere performance at the University of Memphis, with violinist Marcin Arendt, cellist Kimberley Patterson and the University of Memphis Symphony Orchestra, conducted by Harvey Felder. The piece was prepared in Dorico, and I spoke to Mark about the work, the performers, and how Dorico helped him to achieve a successful first performance with little rehearsal time. 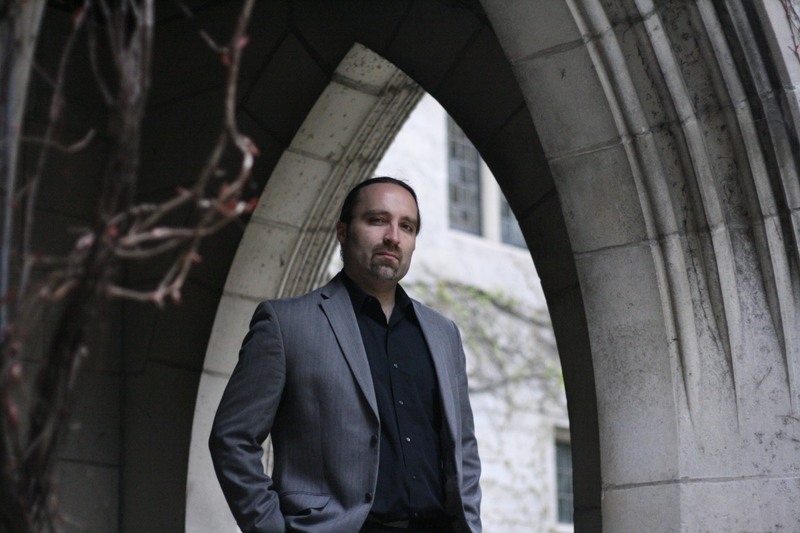 Mark Nowakowski is currently on the faculty of music at Kent State University in Ohio, having achieved two undergraduate degrees from Illinois State University, a masters degree from the University of Colorado at Boulder, and then a Doctorate in Musical Arts from the University of Maryland. As a composer he is increasingly in demand, with recent commissions from the Kronos Quartet, the Monteverdi Cello Octet, the Cracow Brass Quintet, and many more artists and ensembles. The son of Polish immigrants, both his bicultural experience and his deep appreciation for Catholic mysticism is reflected in his work, with Mark citing composers of every age from his ancestral country, from Chopin to Gorecki, as well as American composers, as influences on his musical voice. DS: How did …with their names upon their arms. come about? MN: Regarding the piece, I found myself at the time both listening to the music of the eastern Churches while also reading about the various atrocities taking place in the middle east. I came across one particularly heartbreaking story of a Yazidi mother whose family found itself in the path of ISIS. She witnessed children being stripped from their parents, and girls being renamed with Islamic names and forced into being child brides or worse. Fearing that this would happen to her children, she earned the ire of her captors when she made crude tattoos of each child’s name on their arms, so that “they would not forget who they are.” This reminded me immediately of the poignant opening of the harrowing Polish book Medallions – an unflinching series of eyewitness accounts of the worst of Nazi brutality – which begins with the haunting and brutally direct observation that “People dealt this fate to people.” My music is not about this suffering nor do I think that it can express it in any meaningful way. Yet it was a part of my inner life and thoughts as I worked on this piece, and so somehow it becomes a meditation upon such subjects. DS: That’s a beautiful and hopeful idea. 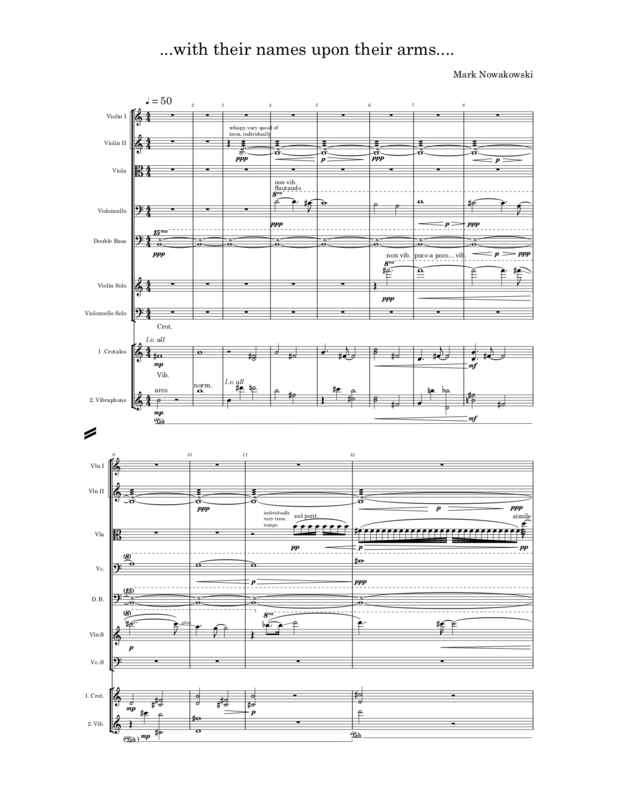 You wrote the piece for your friend and collaborator, violinist Marcin Arendt. How did the two of you first become close? MN: I’ve known Marcin since my first day of grad school at UC-Boulder. We shared many commonalities of convictions and culture, and ultimately this would lead to both a deep friendship and the first recording of Blood, Forgotten for violin and multimedia; Marcin would record both the accompanying figures (that were later sculpted digitally) and the solo violin parts. The work was recently released with Marcin’s accompaniment and the work of soloist Emily-Ondracek Peterson on the Naxos release of the same name, Blood, Forgotten. In recent years Marcin and I have reconnected to share our new resources and career goals, first leading to the recording of the piano trio Reaching for a forthcoming CD release, and now with the commissioning of …with their names upon their arms.. Joining our collaboration was Marcin’s fantastic colleague Kimberly Patterson and the University of Memphis Symphony Orchestra under the capable leadership of maestro Harvey Felder. DS: This is the first large-scale work you’ve prepared in Dorico, after many years of using Sibelius. How have you found the transition? MN: Sibelius had served me well for over 15 years, but when I experienced the first release of Dorico I knew that the future might be right around the corner. I transitioned into the software from Sibelius via several smaller chamber projects and a choral work, 2018’s tu autem Domine. Now with Dorico 2 I think that the team and Steinberg have truly fulfilled the promise of version 1.0 and subsequently advanced to the head of the pack, while I’ve also found that the software also fits my workflow very neatly. As I’ve learned the new package, I’ve found that everything makes a kind of logical sense in Dorico, and once you learn to see scoring the way the makers of software see it, you end up doing things more quickly and efficiently. The engraving process has also become much faster, something that is always wonderful when a piece of music has a very short turn-around time. DS: Were there any features that were especially helpful in the preparation of the piece? 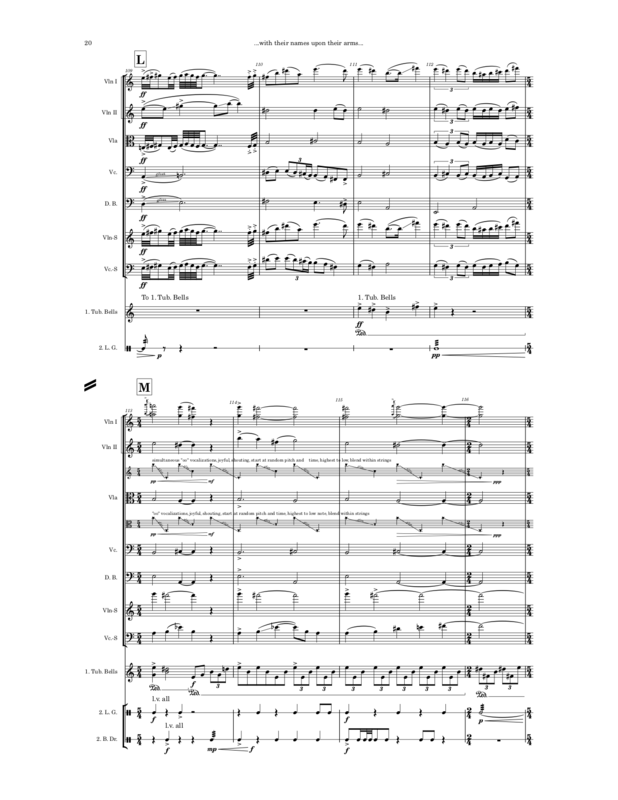 MN: For this particular project I had a very short rehearsal schedule, so Dorico’s ability to combine both composition and the crafting of a mock-up were very helpful. The mock-up certainly helped the preparation process for orchestra and soloists alike. I also love the ease of using third party instruments in Dorico; for this particular project I combined various Spitfire samples for my string orchestra, percussion samples from EastWest, the Joshua Bell Solo Violin and Tina Guo Legato cello as my playback tools, blended together with a third party convolution reverb. It’s never been easier to do such things in the notation environment. Other times, I just default to NotePerformer. As a composer I want my colleagues to know about such resources for their creative efforts: where before composers wrote by hand while plunking notes on an out of tune piano somewhere, today we have this brilliant digital environment which not only makes engraving a breeze, but puts world class players at your fingertips while you create your works. Why wouldn’t you use such tools? DS: Thanks for taking the time to talk with me about your work, Mark! For more information about Mark, please visit his web site. If you’ve not yet tried Dorico for yourself, there’s never been a better time to give it a whirl. You can download a fully-functional 30-day trial of Dorico from the Steinberg web site. Special educational and crossgrade pricing (for users of Sibelius and Finale) is available.